We don’t tend to celebrate Twelfth Night. For a start I can never work out whether it is the 5th or 6th January. For a second I am partied out and crave peace, simplicity, even solitude after the Christmas and New Year festivities. For a third, there is the business of a new school term to contend with along with the accompanying dreams of not being able to locate a class….or my notes….. or a set of marked books. You get the idea? These dreams never leave me before a new term starts, despite nearly thirty years of experience at the chalkface (or Smart board, as it is now). Finally it isn’t long till Hen Galan, traditionally the Welsh New Year which I’ve blogged about before. If you feel the urge for a get together this weekend then I’m told that a galette is the cake to make complete with bean and pea secreted within its lusciousness and paper crowns for the King and Queen of Misrule. Charades is the game of choice. Someone pointed me in the direction of Mary Berry’s Twelfth Night cake, All fine and dandy if you can bear to mush up pineapple, snip dozens of dried apricots into tiny pieces and quarter a mound of glacé cherries. Not my way of achieving New Year zen, I can tell you. At Country Gate we will be storing away the decs, relocating the tree in the front garden for the local hospice to collect for chipping and composting and sweeping up the detritus of the last two weeks. Clean sheets on everyone’s beds, freshly polished furniture and a cup of hot chocolate by the fire tonight is a fitting way to bring the season to a close. 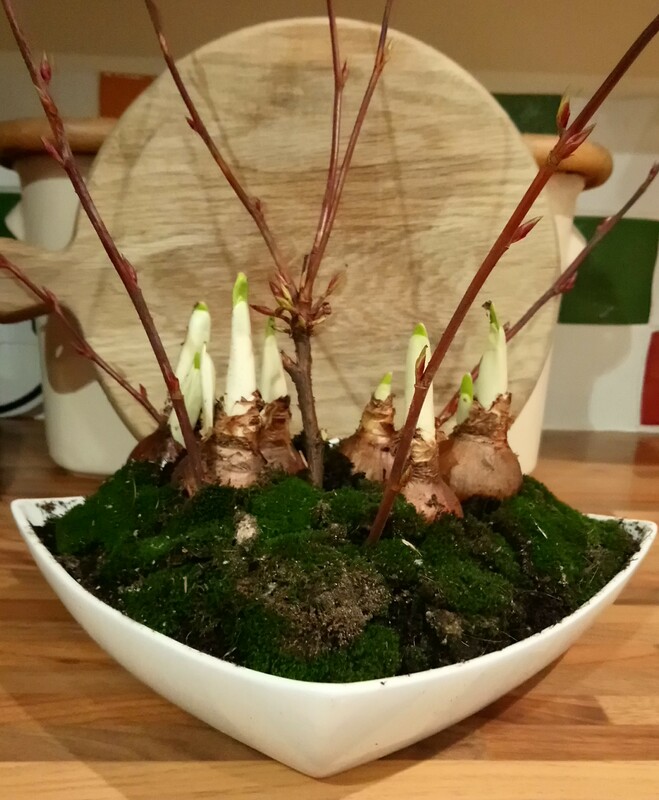 I have however snipped a few budding twigs from the front garden to frame some forced daffodil bulbs in an old bowl and topped it with moss scraped from the shady side of the terrace to celebrate the end of Christmas. If you didn’t think about planting daffs in pots weeks ago then think of me as your fairy godmother. Hear this! You can pick them up for a couple of quid in most garden centres and even some supermarkets now. It’s a great way for children to spend that last bit of pocket money Granny gave them before she went home. No tooth decay, no sugar rush and a thing of beauty to bring them joy in the dark days of January.